We treat the notion of agent as primary in the definition of concurrency. Our computation models, ACSAs and CSAs, come from [LRT], which axiomatizes these two classes along with various subclasses. 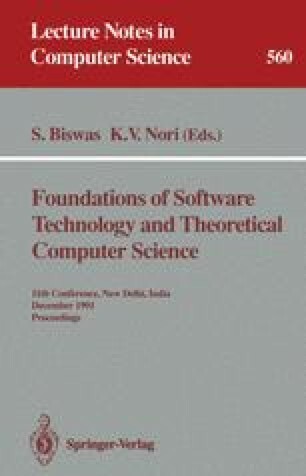 The language considered in [LRT, LT] can be obtained by closing propositions from P ∪ T under boolean operations and the agent-indexed modalities ⊟i and □i, i ε ℕ.
R. Parikh pointed out [Pa] that the logic in [LT] could be translated into basic tense logic with agent propositions. The language Ψ is much simpler while still retaining the “local future” abilities: we have eliminated the agent propositions and demonstrated that our systems can be axiomatized either by using agent propositions or by using indexed modalities as preferred. As a technical improvement, we note that the axiomatizations of ACSAs and CSAs in [LRT] used an inference rule (TE) to enforce an event to be within an agent, which is shown to be unnecessary. The main technical question which remains is that of decidability. The logic Φ is easily seen to be decidable by way of the decidability of Tense S4. We conjecture that all the other logics we have considered are decidable.